Animal X-rays are appropriate for grades K+. 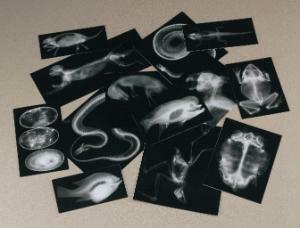 Real animal x-rays. Study the differences and similarities between mammals, reptiles, fish, amphibians and birds. Use on a light table to examine minute detail. Learn about each animal and the process of radiology. Use the idea guide to learn many interesting facts about each animal such as their habitat, group type and distinctive features. X-Rays include: Common marmoset, Frontosa chchlid, dwarf crocodile eggs, green tree python, veiled chameleon, Infant kangaroo, red-tailed hawk, box turtle, pumpkinseeds sunfish, infant green iguana, western diamondback rattlesnake, European rabbit, leaf frog. Each X-ray measures 20 x 25cm. Includes an activities guide. Set of 13.